As December rolls on each year, it becomes evident how much more excited hte boys are about the very prospect of Christmas. It's not surprising from their father who once began Christmas morning at 4 o'clock in the morning after receiving a fair amount of pushback from my parents. With cooling temperatures we were able to take a final Pokemon jaunt downtown where Elliott caught a Ditto and Martin's ran away. He was not happy about this but dealt with it much better than the Arbok incident at Adler Planetarium earlier this fall where his anguish could not be healed by any means known to me. I had a cavity replaced on the second day of the month and had to receive a triple dose of novocaine in order for the work to be done. As such my face was numb for about five hours and I had to have a milkshake for lunch. 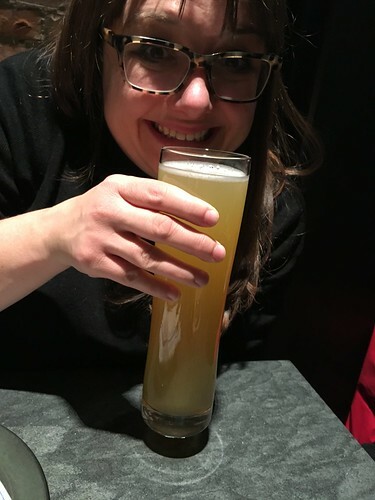 Josephine, upon getting a glimpse of the milkshake cared nothing for my pain and drank about half of it while I looked longingly upon my only available sustenance. We took the kids to the Arboretum for Illuminations and it was a far better success than last year and a bit better than three years ago. We were fortunate to do it on the absolute warmest day of the month and without the precipitation present in previous years. The next morning Jen traveled to Florida and I won the kids over with giant cookies the size of their heads. We returned to the Arboretum but the chill in the air ended up keeping us mostly indoors to catch Pokemon in the warmth. When I got Josephine to sleep for her nap we were able to make gingerbread houses. The boys kept their end of the bargain by being silent while I got her to sleep. I kept my end of the bargain by letting them mostly get icing over every inch of the dining room. After a good nap Josie was in great spirits and ready to mix it up with her brothers once again. We got to play a bit in the basement where Martin put on an incredible performance for all of us. Josie took to the piano instantly and whined in true eighteen-month-old fashion whenever the piano stool was not placed adequately close to the piano. We watched Home Alone, a movie they thought was okay last year but were in hysterics during the entire movie this year. As an adult the things that Kevin does to the burglars at the end is a little disturbing but nothing was too violent to stop the peals of laughter filling our living room. The kids got to start their advent calendars, a newfound passion for Josie. She now just stands below the shelf where they are kept looking longingly at it and muttering her best approximation of the world "calendar" over and over. 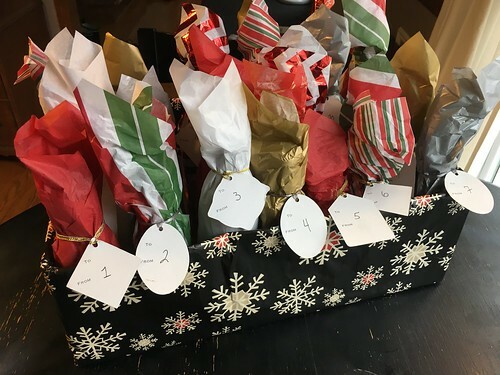 Additionally, I got a chance to start my second annual beervent calendar which Jen did a fantastic job on just as last year. 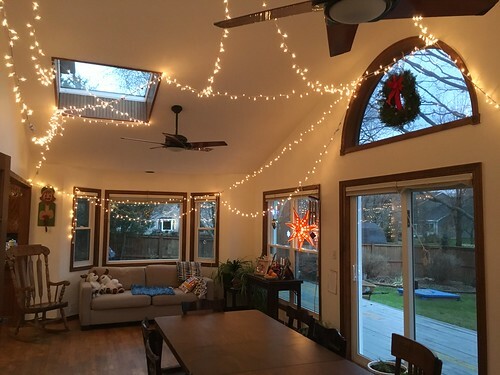 I was also able to do a pre-holiday clean, getting the house organized enough to last nearly 48 hours before being completely trashed. We had an unexpected visit from Auntie Lauren and cousins who were able to enjoy the first fire of the year with us. The first snowfall of the year happened conveniently while Auntie Lisa was visiting for Oliver's first birthday and, while I worked, they were able to build their first snowman who they named Pierre the Crossfit Snowman. We also got to enjoy the first snowfall of the year on our way to daycare. My week off work began with me taking Josie to the children's museum for the morning after which she took a three hour nap. The next day the kids were all off school and we were able to snuggle for warmth. The warmth dissipated quickly as we ventured out on our first trip of my vacation to cut down a Christmas tree. Unfortunately the tree farm was a pretty big disappointment and the only thing that got cut was Elliott's hand when a cat scratched him. 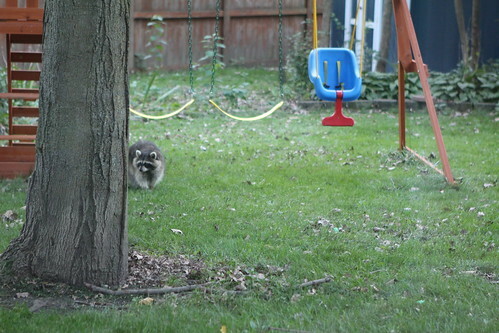 He declared that he wished to never, ever return to the vile tree farm as we left. Josie did not tolerate the farm much better, kicking us with muddy boots as we tried to usher her through the rows and rows of disappointing trees. 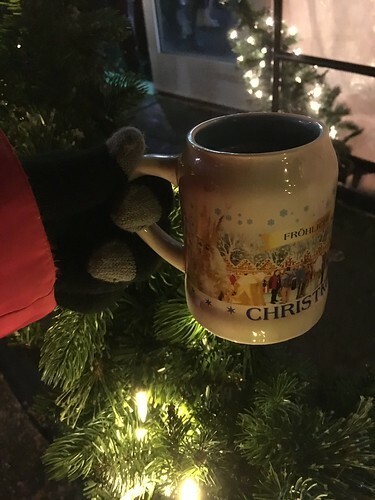 Jen and I were able to get a rare night out where we got to sip mugs of hot glühwein while braving the freezing cold of the Christkindlmarket. We later ventured out to the new Two Brothers location downtown and had a fantastic dinner free of children and worry. 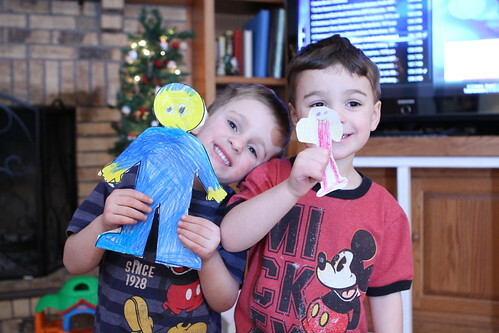 The next day the kids decorated their mini trees by the fireplace. They also rearranged every chair and toy they owned in order to stage the perfect recreating of Santa's sleigh. We had about twenty-four hours of snow and I was fortunate enough to have some pretty good helpers in clearing the driveway. Unfortunately, after completing the driveway they wished to continue shoveling the lawn rather than going inside to warm up, my preferred way to close out a round of shoveling. We also did a Christmas photo shoot with the kids after canceling the shoot we had scheduled with a pro because of the dire weather warnings we're received from our unreliable meteorologists. We decided to brave the elements on Sunday night and took the kids out to finally get a Christmas tree in the driving snow. The kids did better on this expedition, probably because there were fewer roosters and cats to attack them. Overall the week I took off of work was highly productive. 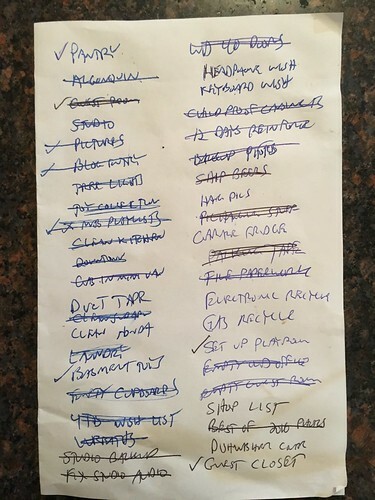 I didn't get everything on my list done, but I was pretty happy with the things that I was able to cross off. The temperatures plunged into the negative numbers and waking the children up and to school became more of a challenge than normal, sometimes requiring extra layers during breakfast. At school Elliott drew a picture of Martin and gave it to him. When we got home Martin wordlessly go the crayons and scissors and went into the other room. He came out with a picture of Elliott. Elliott was so happy that he just ran circles around the house squealing with delight. Then they posed for this picture. If you ask Elliott he'll still say that he thinks Martin stinks. 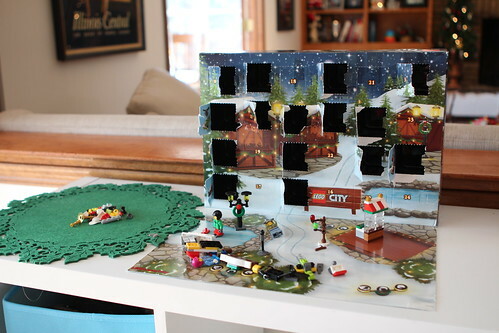 The Lego advent calendar we got the boys in Montreal has been a huge hit. They run downstairs every morning to open it up and see what they get to build for the day. Elliott is remarkably good at building the daily items even without any instructions. Today they had their last swim class of the session and the year which means they got to use the water slide. It also meant that they got to get snacks from the snack machine. Normally we take them home and I make them a wonderful lunch. Sometimes we go out to a restaurant. However, the thing that they always want more than anything is to get something nasty, like Cheetos, from the snack machine in the hallway outside the pool. We never let them do it but I gave them a special treat and let them do it today and they could not have been happier. Sadly, Jen, who had to stay at home with a very sick Josephine, did not get a chance to witness the sheer joy in her sons' hearts after this special treat. 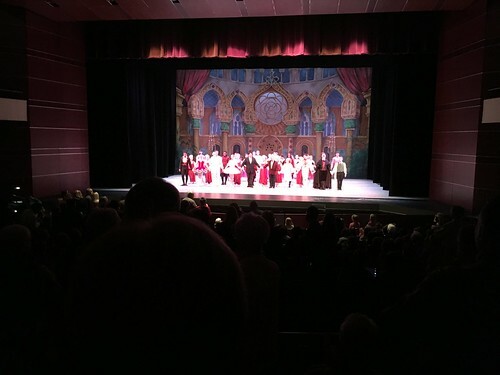 After swim class we took the boys to see the Nutcracker. Due to an extremely rough departure we were almost late to the production. We let our hungry sons know the price for their tomfoolery was no snacks until intermission. They were not thrilled about this reality but dealt with it much better than I would have expected. At intermission I took them out to get popcorn and they were extremely well behaved throughout the entire show. After the show Martin got to pose with several performers, including the lead. Elliott, well, he generally doesn't go for stuff like that. 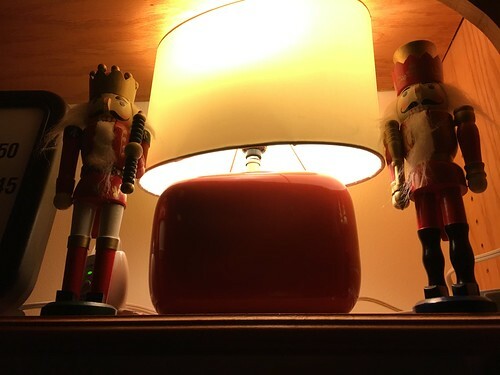 As a special surprise Grandma got them their very own nutcrackers and they put them on the shelf overlooking their beds to stand watch for the sneaky mouse king. Martin fell asleep in under five minutes, even with Elliott intentionally trying to keep him awake. That is always the mark of a truly successful day. Before leaving for our trip I had ordered a few special gifts for the boys to receive upon our return. The first was in fitting with their newfound obsession with Pokemon. It was a gross of random assorted Pokemon figurines. They're pretty tiny but were a really big hit. Much like our last trip we returned a few days before everyone had to go back to school and work and were able to enjoy a few days of relative relaxation just hanging out around the house and not having to pile into a car for multiple hour rides. Jen made her fall fun list with the kids after the success of our summer fun list. 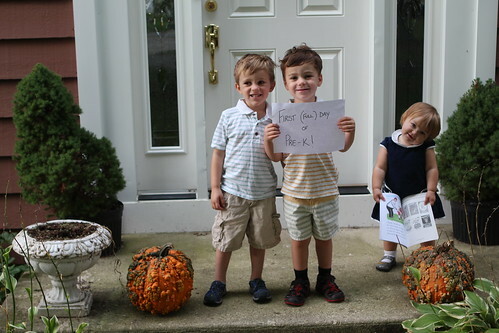 The boys had their first day of Pre-K, and Josie began her regular full day attendance. She seemed to grow accustomed to it much more quickly than her brothers had when we first moved here. Most years we procrastinate apple picking until the trees are pretty much bare. This year we got a great jump on it and were able to pick apples in beautiful weather before the Honeycrisps were even ready. We also got to see two trees planted with seeds from Johnny Appleseed. We were advised against eating apples from the tree as they were deemed to be "kinda nasty." Still, it's fun from a historical standpoint. We took the kids to Aurora for the morning to get coffee and hunt Pokemon. 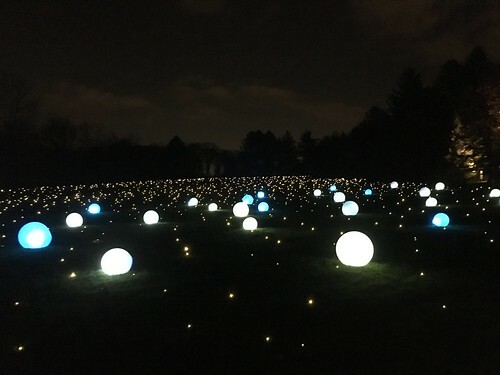 We also followed up with a trip to Adler Planetarium where we marveled at the beauty of space and also took part in some of the best Pokemon hunting in the Chicagoland area. Jen probably enjoyed the Pokemon hunting the most due to her intense hatred of space. For my birthday I got a sweet deal on a really nice bike and also just happened to get a sweet deal on a bike trailer thanks to Target mislabeling it in the store. So I took Josie on a ride by the river to test it out. Cousin Oliver mysteriously contracted chicken pox prior to his scheduled vaccination so we had to take all the kids in for emergency boosters just to be safe. Since getting booster shots is not the best after school treat we took them to Colonial Cafe where they just happened to have someone going around making balloon "animals" for the kids so the night ended up better than it started. We took the kids to Geneva where we went to Island Park where they got to take advantage of a playground with an amazing rope swing. 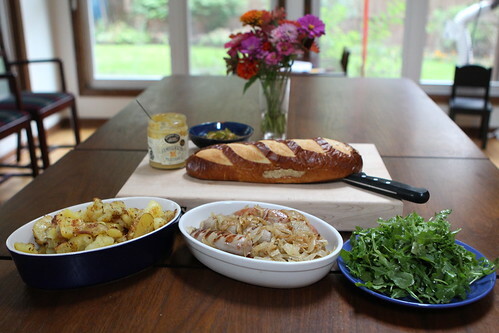 We were able to celebrate Oktoberfest with a wonderful assortment of Oktoberfest foods. I was too lazy to make spaetzle but everything else was delicious. We waited way late into the "summer" for our first fire of the year but the kids went crazy for s'mores. We visited the Morton Arboretum and took advantage of their beautiful fall foliage. The boys also tried their hand at battling gyms in Pokemon Go with their mother for the first time. I think she did most of the heavy lifting in those battles but Martin's ferociousness in battle is something to be reckoned with. 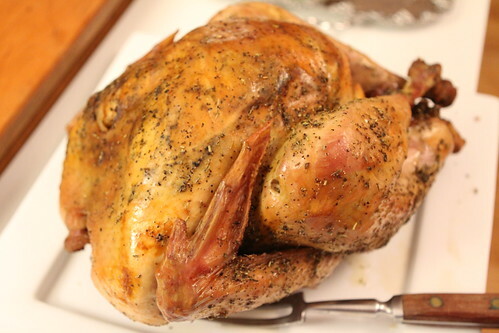 Canadian Thanksgiving rolled around and I achieved perhaps my finest roast turkey of my life. Brining for a day and then interlacing bacon slices under the skin is apparently the key to achieving success and something I look forward to duplicating again in the future. We were also visited by a hundred pound raccoon who now calls our yard home and is apparently able to scale our fence in less than a second. We took the boys back to the planetarium by request and left Josephine with Grandma for the afternoon. While it was sad to not have her take part she doesn't get a ton out of it and it's about ten percent as hard taking just the two of them. Eighteen-month-olds do not make anything in life less complicated. Martin's coloring obsession has reached newfound heights as he continues to color his way through any Pokemon he can think of. We had a long awaited sleepover with Evelyn and opened up the next morning with my normal pancakes by request. That morning was ninja turtles, a brief break from random Pokemon. We were even able to enjoy a last meal out on our fall leaf covered deck when temperatures reached the eighties one night. Trunk or Treat came upon us and we had, by far, the best time this year. The boys have reached an age where they are infinitely more manageable and the weather was so perfect that Josie had little to fuss about, particularly with how much candy she ate. The cousins joined along as all five children kept to a superhero theme this Halloween. Raking this year was its normal never-ending nightmare. While I enjoy mowing the lawn far more than I thought I would as a homeowner, the act of raking leaves to me is one of the worst chores imaginable. I'm not very good at it, I hate it, and I put it off until patches of our lawn are dead. I really do miss having a super. Nana and Grandpa showed up before Halloween to join in on the endless coloring and preparation for the Halloween celebration. A rare Nana and Grandpa tea party occurred, normally reserved for visits by Grandma. Pumpkin carving garnered a lot more interest by the boys this year. Last year they just kind of looked at the pumpkin in passing while I did all the work with the help of Evelyn who was actually pretty interested. This year they were pumped. Trick or Treating was also an activity that held their attention longer this year. Again, the beautiful weather certainly helped but they were all so into it. On my birthday we took the kids downtown to the library and had lunch at a restaurant nearby which was a lot of fun. 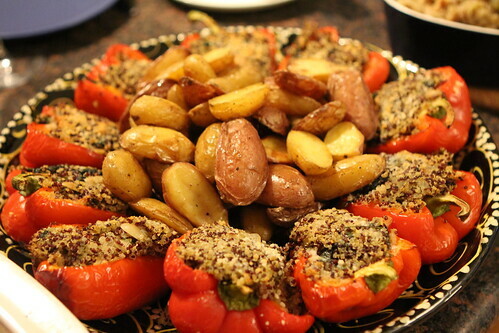 We went out the following night for dinner with my parents and had a great time. On election day I took the boys with me to our polling place to show them how the voting worked. They seemed to think there was a lot more crawling under the tables involved than is typical a part of our nation's electoral process. We also went to Target where the boys tried on about a dozen different bike helmets but were so well behaved about not buying everything they saw. Then we went out for lunch in Aurora where I let them catch some Pokemon as well. Afterward we headed to the river to search for more Pokemon. Then we took a nice bike ride in the prairie enjoying the beautiful weather. For dinner I made a sausage and cornbread stuffed roast pumpkin, an annual favorite that we hadn't yet gotten to this year. For Thanksgiving we had a proper kids table for the first time in a long while and the brilliance of the kids table was reinforced by the experience. I'm sorry to tell them that they won't be joining the adults at the table for any holiday again until they're eighteen. We had a great day after Thanksgiving just kicking around the house and ended up unexpectedly decorating the entire house for Christmas and watching Christmas movies. This is probably the earliest we've ever done this but with the kids being as into it as they were it was worth it. We also did our second annual unplanned trip to Meijer. Completely against character we bought this animatronic Santa that sings a weird parody of Tutti Frutti with a Christmas theme and Elvis impression. They kids all love it so much it was hard to resist. They just set him off and then sit there and marvel at his magnificence. After dinner I gave the boys their first egg nog of the year. They were hesitant at first, not really remembering it from last year. However, I think Martin's reaction after his first sip tells the tale. They were hooked and are likely going to lose their minds when January comes and we can't get any more.